Just in from Lindsay Mahoney…. The Messalonskee Middle School staff and Olympian Julia Clukey recently accepted the ALS ice bucket challenge! After hearing Clukey speak about overcoming obstacles and persevering to accomplish personal goals, 42 lucky MMS students had the privilege to dump water over the heads of their teachers and Ms. Clukey. 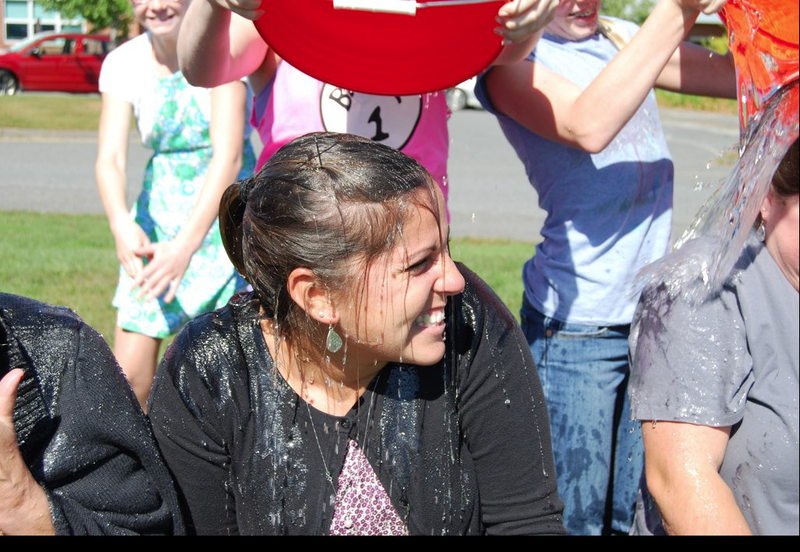 Students were able to purchase tickets for the chance to dump buckets of ice water over their teacher’s heads while teacher’s paid $10/each to participate. After spending time reading, watching videos, and discussing this cause and craze that has gone viral, students and staff collectively raised over $600. After all the excitement, we forgot to challenge other schools so maybe yours will be next! This entry was posted in Good teaching, Young adolescents and tagged Ice bucket challenge, Messalonskee Middle School. Bookmark the permalink.